After discovering your brand's intention, this will inform you on what type of content to create and the proper channels to communicate your intention, products and services. Start with your intention and the product/service in mind to get ideas on what content to create. Mind mapping is a free-form way of brainstorming ideas. It's more dynamic than listing and aligns with how our brain maps out ideas, thoughts, problem-solving, etc. Your content inspiration can come to you in many ways. You can source inspiration from your own personal experiences, conversations within your community, and the news/trends in the media. Keep in mind, the content you create should align with your business goals and your community’s interest. Take your time with this exercise. Spend a few minutes, hours, or days on this. Let your ideas simmer and reflect on it. 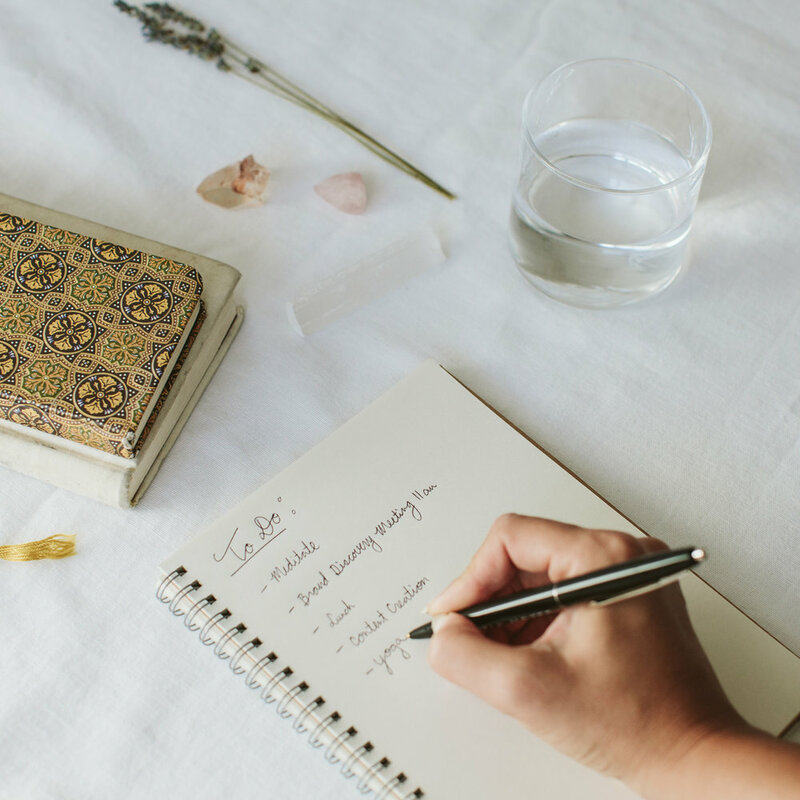 Take breaks to refer back to it later from your first exercise, so you can have a fresh perspective and new ideas. Below is a general guideline and workflow on what content to create based on a product or service-based business. Once you have some general ideas on what content to create, you can create a plan that aligns with your audience. It's important to note that the content you create should resonate with your ideal client, customer and community. Creating content for the sake of sharing content won't be as valuable if it doesn't connect. Create a roadmap for your content. Define your Content Types, Categories, and Channels. Your customer, client and community will be the determining factors on what content types and categories to create and the appropriate channels to deliver your content. Think about who is consuming your content and how you are going to create a digital experience for them. Where is your ideal customer consuming content? Example: Website, Social Media, Blog, Newsletter, etc. How frequent will you be sharing content? How much time does it take for you to create content? Keep in mind that you are telling a story and creating a conversation. Create content that connect + engages your community. You will learn step-by-step how to create content on different platforms in the next module. Refer to the information below to guide you while you work on your CONTENT STRATEGY. Let’s start this section by thinking of this as your content themes. Content can be educational, inspirational, entertaining, promotional, and personal. Each brand will have their own unique set of content categories and it's not necessary to create content for every type of category. What is important is having a variety of content categories rather than focusing on one category. For example, constantly sharing promotional content (sales, products, service offerings) will feel like a one-way exchange with your consumer. Creating engaging content for a consumer that educates, inspires, entertains or personally connects, leads to higher engagement. When value and trust is built, there's a higher likelihood of action from a consumer. Where is your content going to live? It’s not necessary to create content for every platform available. As a small business owner, your time is very valuable and maybe limited. Since the process of content creation can take a lot of time until you have a system in place, start with 1-3 channels to communicate your brand intention, products or services. At the minimum, you need content on your website and on a social media platform like Instagram. A website is your digital store front, your portfolio and how your potential customer will consume your content to make a decision in purchasing your product or service. At the minimum, the most time and monetary investment should be spent on your website. Keep in mind that you are creating a digital experience for your customer or prospective client. Visuals for your landing page and About page. Tip: For fashion brands and e-commerce businesses, your landing page should showcase your most recent collection. Showcase current and past collections. Your shop page will consist of product and styled editorial shots on your site. For brands with both wholesale and direct to consumer models, your visual representation of your collections online should entice both retail buyers and online customers. For holistic service-based businesses, you can include a description of your offerings and visuals that communicate your brand. If you are offering health coaching, you would have visuals that visually communicates a 'healthy lifestyle'. Think of whole foods, nature, exercise, meditation, etc. Your website will contain fixed visual and written assets that live on your landing page, About page, service(s) list, and Contact page. A blog or journal is updated frequently and can drive organic traffic to your website through the power of search engine optimization aka SEO. Sharing content on a blog can also serve to inform your prospective customer or clients of your intention, products, and services. Create blog content that educates and inspires your current and prospective clients. 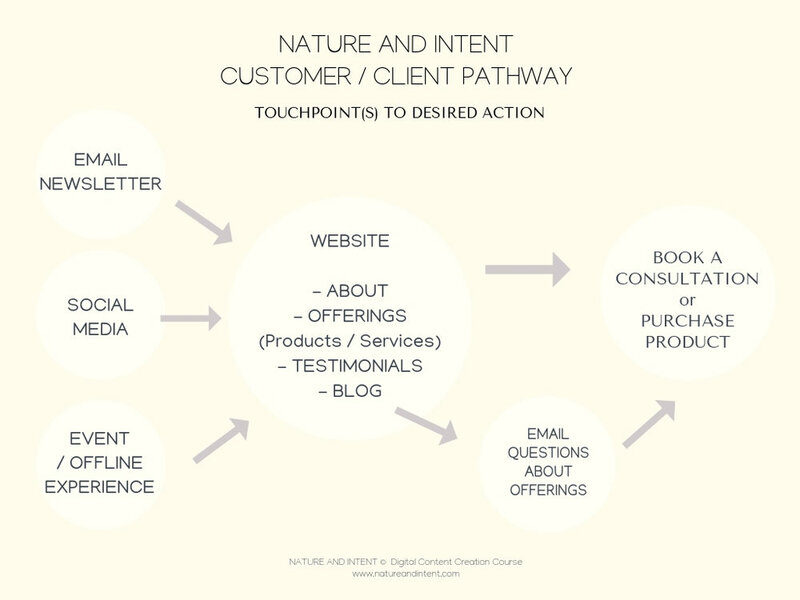 In the Nature and Intent Journal, we profile conscious brands and insights to add value to the digital space. It supports our intention, creates a visual portfolio or how we create content (visual and written) and communicates our conscious approaches to content creation, marketing, and business. For online businesses, an email list is essential to grow your community and drive sales. Depending on how much content you create for your blog and other platforms, the content should align in your email newsletters. You can create new content for your email newsletter or summarize what you've shared on other platforms (blog, social media, etc). Share bi-weekly emails that recaps featured content on website and social media. Your emails will introduce any new products and offerings. Instagram is the leading social platform with the highest engagement. Over 70% of businesses use Instagram, so having a presence on this platform is almost essential. Social media is a powerful tool to create a direct conversation and feedback from your community. You can share and test your different brand tones in social media platforms and this should be updated regularly with engaging content. Instagram is a very visual experience. Creating original visual content will set yourself apart. In the "Basics of iPhone Photography" module, there is a step-by-step workflow on how to capture and edit photos to share on Instagram. 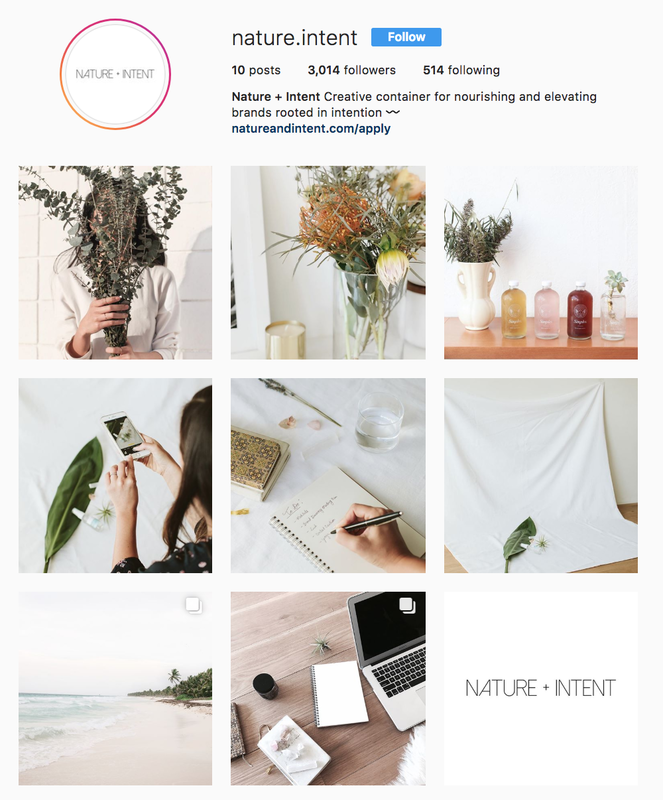 Example Instagram Strategy: Create establishing visuals that introduce the launch of a brand or new offerings for the first 6-9 photos shared. Share visuals weekly that mirror the content on the website. You can continue to share content from each content category weekly. The above platforms will be a good place to start. In the next module, you will learn the step-by-step process on how to create content for each Content Channel. However, you are not limited to these platforms. Below are several examples of how to share content in the digital space. Audio books, Case Studies, Courses, Infographics, Interviews, Ebooks, FAQ, Gifs, Guides, How-tos, Magazines, Mobile App, Podcast, Q&As, Quotes, Reports, Research, Surveys, Testimonials, Webinars, Worksheets, Vlogs, and more. Golden Tip: Repurpose your Content. and create new content for every platform. Example: From a written blog post with photos and graphics, you can take excerpts from the post and share slices on social media and your newsletter. We featured sustainable fashion brand on our JOURNAL and shared the photos and graphics on our Instagram. Think of your website as the whole pie and your different platforms will have slices of this pie. If you have high-resolution images for your website, you can share these on social media and in your email newsletters. You can turn written content into visual content by creating graphics. You can turn video content into audio content (like podcasts) and written content from your blog posts into graphics for Instagram. Refer to the Customer/Client Pathway chart below and use your completed Content Strategy worksheet. Envision how you can maximize content you create to be shared in different platforms. Creating content with a strategy can be a simple or daunting process. If you’re feeling stuck on this part, know that having a plan will help you feel less overwhelmed in the content creation process. After years of producing content, what has always been proven to be stressful and inefficient is creating content and publishing content on the same day. You can always share content in the moment if that is more authentically aligned with your workflow. But it’s important to schedule time and create a system that allows for the different phases of Content Creation. You will do this on your own with the knowledge you’ve learned and the strategies you have created from this course! It’s also important to note that your content should be shared in alignment with any product launches, events, sales promotions, collaborations, and other brand announcements. Start by planning out your Content Creation Workflow Phases with a Content Calendar. Created and produced monthly co-working and wellness pop-ups in Los Angeles. Shared content on different platforms one-month out (website, email newsletters, Facebook and Instagram). Then, continued to share content weekly and daily leading up to the day of the event. Content on social media leading up to the day of the event shared the activations and offerings of the event. A similar strategy can be applied to product and service-based promotions. Share content in alignment to a release of a new collection, a new offering, holiday sales, or re-establish your brand story and values. The most important takeaway is to create quality over quantity content. Less is more. Creating value for your brand with your content can take time especially if you're new to writing, photography or content creation. The valuable content you create will be worth the effort if it connects deeply with your aligned community. Creating a strategy is both a creative and intuitive process. Every brand owner and business will have a unique strategy. If you need one-on-one support with this process, please book a session with Nature and Intent here. In the next section, we provide the action steps for content creation and production. 1) What types of content you will create to communicate your brand intention, products and services. 2) Which content categories and types align with your ideal customer. 3) Where your content is going to live. What content channels will you use to deliver your content? Extra Credit. Below are some supplemental reading on Content Marketing. Gary Vaynerchuk "Everybody Should Be Doing Content Marketing"